I don't know what it is quite yet, but I have a feeling its going to be good. I went shopping at my favorite shop, Anthropologie, today in search of something to wear to our engagement pictures next weekend. I am still in San Francisco so I made a trip to the store in Union Square. As usual, I hauled way to much stuff to the dressing room and then had to make some tough choices. I do love that store, but the prices prevent me from going to town. At the register, the very helpful sales associate asked me if I wanted to register for Anthro. For what? Their new "rewards" card. Unfortunately, there doesn't seem to be one of those buy 10 get one free gimmicks (otherwise, ca-ching! ), but there seem to be some other benefits. No more digging around for a receipt for returns as they will all be stored in some database. There will be some early bird specials, although I think its more along the line of get it first rather than get it cheap. They also seem to be looking for more feedback from the customer. Hopefully it will grow to be a little more, but for now I am happy to join! Plus, look at the presentation! 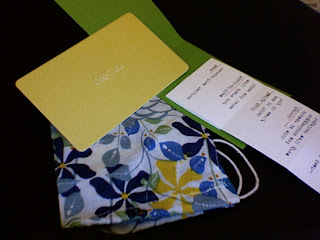 There was a fold out card on pretty green cardstock, a mustard card and an adorable little bag. They get me, they really get me.